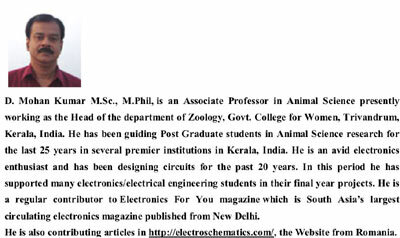 Many of the Students are giving the key word Viva – electronics in Google Search engine and they are directed to this Web page. Hence a New page is started here to support students to answer Viva Voce easily. This page will be updated regularly with new topics. i m working on mobile bug project…..
and i too want to knw tht how a capacitor works as tiny dipole antenna? can u pls tell me sir???? i want to make a project of sort circuit detector but in given circuit diagram only write power supply but not denote how many voltage is applied? please give me total information about that circuit. Please share artical on SMPS. I have circuit of laser alarm it works with 9 vault small transistor battery but it dose not work with 230 ac to 9 dc (eliminator) what is reason ? Laser diode is similar to an LED but it emits monochromatic laser beam. It requires 3 volts and around 40-100 mA current depending on the make.LEDs require fully rectified and ripple free voltage to give full brightness. Laser diode also requires the same. Check the eliminator current. Then replace a 1000 uF 25 volts smoothing capacitor in the eliminator.Also give a fullwave rectifier. It is better to use a 7805 regulator IC for the power supply.